Yes, the big game is scheduled for Sunday, February 3, 2013. 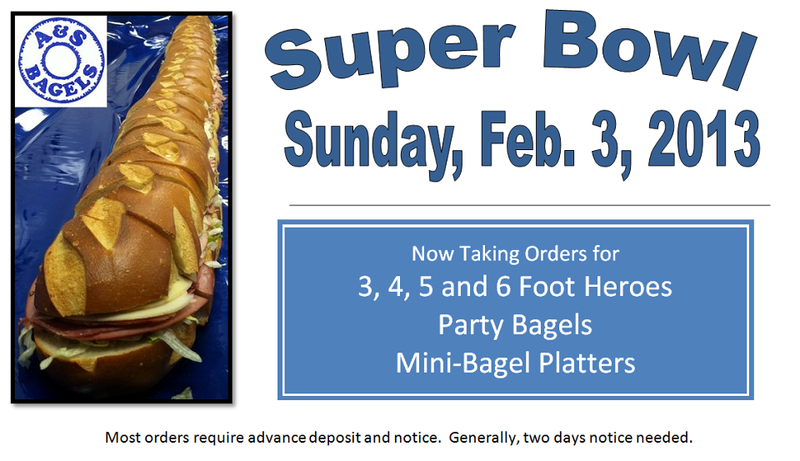 We are now taking orders for heroes, party bagels, and mini-bagel platters. Pictured above is our 6 foot hero. Try our chicken cutlets on a hero, sure to be a hit at your Super Bowl party. A&S Bagels is open 24 hours a day, 7 days a week, but please place your order early. 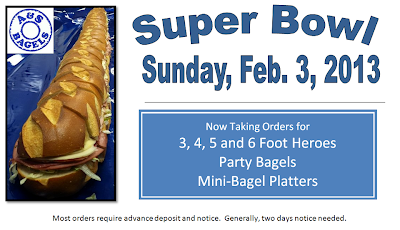 Generally, two days notice is needed for heroes and party bagels. All the pictures, images and content of this web blog are copyrighted and/or owned by A&S Bagels, Inc and/or A&S Bagels has permission for use. No use, or reproduction of any pictures, images or content appearing on this web-site is permitted without the express written permission of A&S Bagels, Inc.